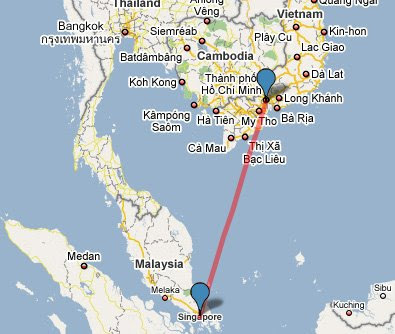 eD@HoMe: Let's travel to Vietnam! “Chào!” (“Hello” in Vietnamese). Today we are traveling to another world, a world where the colors are more vivid, the culture is richer, and the history more compelling. This is the world of Vietnam, the latest Asian dragon to wake from its slumber. Many thanks to Phu Can for sending this gorgeous cover (my first from this lovely country!) 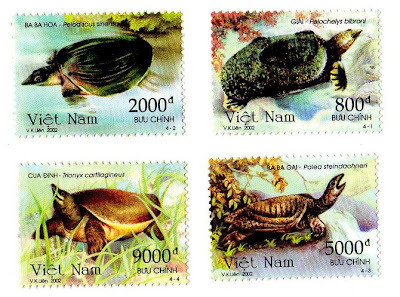 and a set of soft-shelled turtles stamps from Vietnam! This awesome set of stamps depict Asian giant soft-shelled turtle (800d), Asiatic soft-shelled turtle (2,000d), Chinese soft-shelled turtle (5,000d) & Wattle necked soft-shelled turtle (9,000d). It was issued in 2002. The 2 stamps on this lovely cover are part of the “Hue’s Court Music” series, issued on 3rd June 2008. 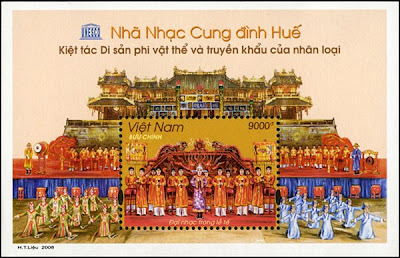 The Hue's Court Music or nha nhac is a music style specially connected to the old emperors in Hue. Nha nhac's roots can be traced to the 13th century and became a genre of court music reserved for annual ceremonies and special events like coronations and funerals. In the year of 2003 the music style was proclaimed as a World Heritage by UNESCO. 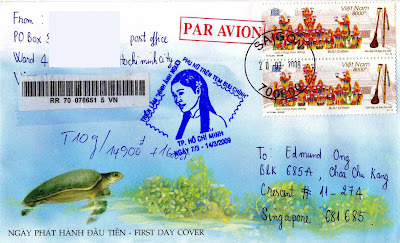 This cover was posted on 20th March 2009 in Ho Chi Minh City and took 7 days to traveled an estimated distance of 1,087km. 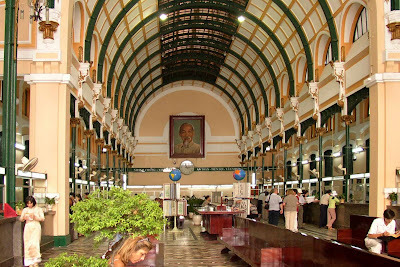 Commonly known as Saigon, Ho Chi Miny City is the largest city in Vietnam. The city center is situated on the banks of the Saigon River, 60 kilometers from the South China Sea and 1,760 kilometers south of Hanoi, the capital of Vietnam. Ho Chi Minh City is also known as "World capital of motorbikes". Cool! What is the famous in Vietnam. I am looking Vietnam travel website.